By Mark H. Kirkpatrick, President, Mountain Construction Enterprises, Inc. and Project Manager for Hearthstone, Inc., The World's Finest Log and Timber Frame Homes. 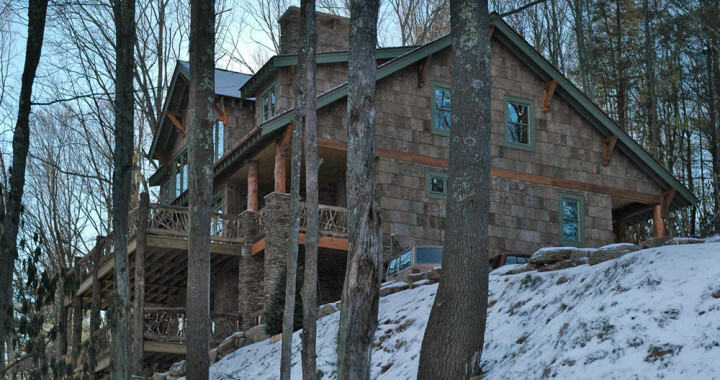 Mountain Construction has been building custom homes in the Boone, Linville, Banner Elk and Blowing Rock area since 1982.We are custom home builders for North Carolina and Tennessee. Wealso build homes in Lake James, NC and Watauga Lake, TN. In the course of design and estimating, or estimating from an architect's design, for our clients, we are often asked to explain and outline the costs and what they include. Many of our clients are from larger cities and communities with flatter terrain and smaller lots. Often these communities have production, rather than custom housing. The production housing rarely has the wood work and trim of the custom nature that we have a reputation for producing. The work that we typically produce includes a high degree of creativity and a significant amount of owner input. When building their Mountain Dream Home, our clients often choose finishes designed to enhance the rustic appeal of the mountains. This article outlines some of the custom, rustic and mountain details that go into creating a Mountain Dream Home. furniture quality finish, increases costs in both Labor and Materials. The use of Recycled woods, ranging from rustic weathered barn wood to antique Heartpine doors, cabinets and flooring will also impact costs. The amount of stonework is usually generous and the fireplaces sometimes have multiple flues and multiple fireplaces, hearths, stone facings on several sides, etc. The number of fireplaces calls for, again, more stone, and more wood/mantel work. Sometimes wood trim up to the fireplaces needs to be scribe fitted to the stone. Mountain Home decks are generally elevated off the ground and must take some foundation stone, flashing, scaffolding labor and carpentry labor to get in place and individual lumber hand-cut and applied to the framing, decking and rails. The application of decking is sometimes screwed and pegged. We have also been asked to build decks from custom woods, such as cedar, mahogany and ipe. Decks built "in the air" are more labor-intensive due both to simply getting it there and for safety precautions. Driveways and grading are generally longer and more complicated than in small residential lots. Many Mountain building lots are on steep grades and require a great deal of grading in order to make the driveway functional. This work also often requires additional retaining walls. Footings involve more steel and more concrete because they are stepped to grade and the bulkheads to hold the concrete in block increments involve more labor and materials. Footings can be attached to the stone, requiring special forming and epoxy drilled steel to ensure permanent fastening. Mountain Homes generally have steeper Roof pitches. Most of the roof pitches in the homes we build are 7/12 to 12/12. Buildings off the mountain usually have roof pitches of 4/12 to 6/12. With a shallower roof pitch there is less roof framing, less plywood, less tarpaper, fewer shingles and less labor. Our clients often request Elk Prestique 40 year shingles or Standing Seam Metal Roof or other more expensive roofing product. We have also built homes using cedar shake and slate roofing. We typically recommend large commercial gutters in order to handle the larger volume of water that we get on larger roofs. The North Carolina Mountains get more rain than any part of the country other than Washington and Oregon. Often, gutters are the 1/2 round "old style" for rustic appeal. Roof overhangs of 16 inches, 24 inches and greater add to material and labor costs, including roofing, soffit, fascia, etc. If you look at the roof overhangs in homes off the mountains, you will note that they run from 12 inches (and less) to no roof overhang at all. 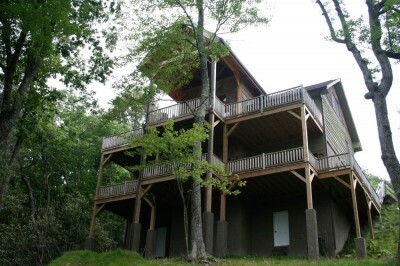 We recommend larger overhangs due to the amount of rainfall in the North Carolina mountains. Excavation and drainage measures on mountain and foothill building sites often require specialized retaining walls and involve drainage and erosion control measures that flat building sites do not. Depending on the site, these measures can be complicated and costly. 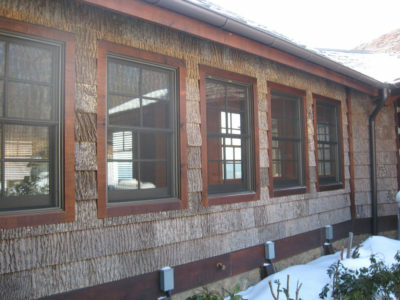 Wood siding is more expensive and more labor intensive than using materials such as HardiePlank. We have built homes using HardiePlank, but many of the custom homes we build use cedar siding, cedar shake, pine "feather edge" siding or poplar bark. Septic systems on mountain and foothill sites must often be larger than in lower elevations due to the amount of stone in the soil. Protecting a more delicate ecosystem is essential to retain the beauty of our growing mountain and foothill communities. The characteristics of masonry in a mountain-style home involve rock pointing and tightly stacking the stone. Stone work of this type makes the home appear more rustic and makes it seem to blend in with the natural mountain surroundings. This is more labor-and material-intensive than running flat stone on a wall. Decking installed and fastened without face nails or screws with hidden locks can help bring out the quality and craftsmanship of custom work. This type of custom work is more labor intensive than standard fastening methods. I hope that this list has helped you in assessing some of the details involved in custom mountain building. We wish you the best with your project and certainly hope that you will contact us if we can be of assistance with your planning for any local Mountain custom building or for your regional Timber Frame work. Our local construction is available in Boone, Blowing Rock, Linville, Banner Elk, Lake James and surrounding communities. Our regional where you want to build. We will gladly work with your local general contractor to provide the Timber Frame or Log subcontract services that meet your needs. 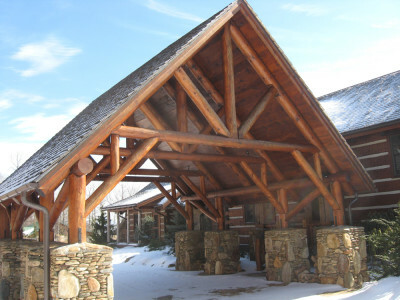 Mountain Construction does custom home building in any building style, including conventional new homes, remodeling and restorations, log homes and timber frame homes and structural insulated panel homes. 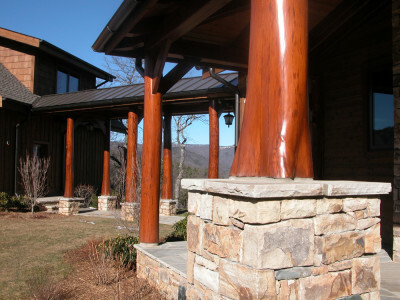 Check out our site and learn more about Log Home Building, our Construction and Remodeling services.